ANSWER-MARKAL is a user friendly Windows interface with a gentle learning curve specifically developed for working with the MARKAL energy system model. The MARKAL model was developed by the International Energy Agency’s Energy Technology Systems Analysis Programme (IEA-ETSAP). For information about IEA-ETSAP and the MARKAL energy model see www.iea-etsap.org and www.iea-etsap.org/web/tools.asp. ANSWER-MARKAL was the first Windows interface for working with MARKAL and has been available since 1998. Since that time, it has been continually upgraded to offer enhanced facilities including the support of new MARKAL model variants as they have become available. It is used by nearly all of the world’s MARKAL modellers. The ANSWER-MARKAL interface EXE provides the energy analyst with facilities for data entry/edit/browse, for initiation of a GAMS MARKAL model run, and for results handling. Model data is stored in a Microsoft Access database. 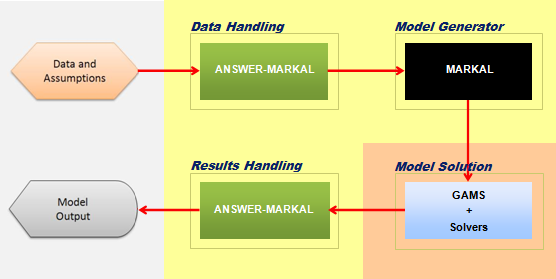 As well as manually entering model data into the ANSWER-MARKAL Access database via entry/edit interface facilities, bulk-loading of model data can be carried out using an “Import Model Data from Excel” facility, with “smart” Excel workbooks provided to expedite the preparation of model data. After carrying out a GAMS MARKAL model run, results from the run can be brought back into the ANSWER-MARKAL database and browsed online. Data and assumptions are entered into the ANSWER-MARKAL database manually using the ANSWER-MARKAL EXE, or by bulk-loading model data from “smart” Excel spreadsheets. Model run initiation from ANSWER causes the creation of text files (in GAMS format) specifying the model instance to be solved by the MARKAL GAMS code. The MARKAL GAMS run produces as output text files containing model results for import into ANSWER. IEA-ETSAP created the first version of the MARKAL model around 1980 and by 1983 a standardized version of MARKAL had been developed. Subsequently this standardized version was enhanced in various ways, including by the development of a number of MARKAL model variants. 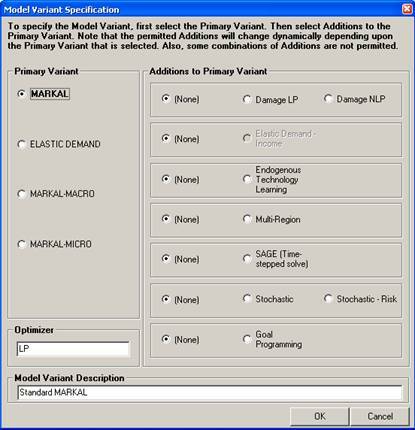 It needs to be understood that each model variant comprises “standard MARKAL” plus extra data parameters, variables and equations that are specific to the particular model variant. Some combinations of MARKAL model variants are permitted. Note that one of the MARKAL model variants above is Multi-Region MARKAL with Bilateral and Global Trade. The original MARKAL model was a single-region model and its extension to become a multi-region model did not occur until 2003. For further details regarding MARKAL model variants, see the Additional ANSWER-MARKAL Documentation and ETSAP MARKAL Documentation sections under Documentation on the ANSWER-MARKAL tab.